TABOR CITY, N.C., May 8, 2017 — The excitement is building across the Carolinas as the Jellystone Park in Tabor City prepares to open a 10,000 square foot interactive water play structure. “We’re working to get it installed as soon as possible,” said park manager Rebecca Murphy, adding that Jellystone Park reservations are running ahead of last year’s figures. The 20-foot-tall AquaPlay structure features water cannons, water slides and buckets that fill up and dump water on children playing below. Other Jellystone Park additions for the 2017 camping season include a 2,200-square foot indoor heated swimming pool, a corn hole court, as well as new campsites and yurts. The park has also added 40 additional campsites and two furnished yurts, creating a grand total of 188 RV and tent sites, 15 rental units and seven yurts. The park also has two bunkhouses that each sleep 20. 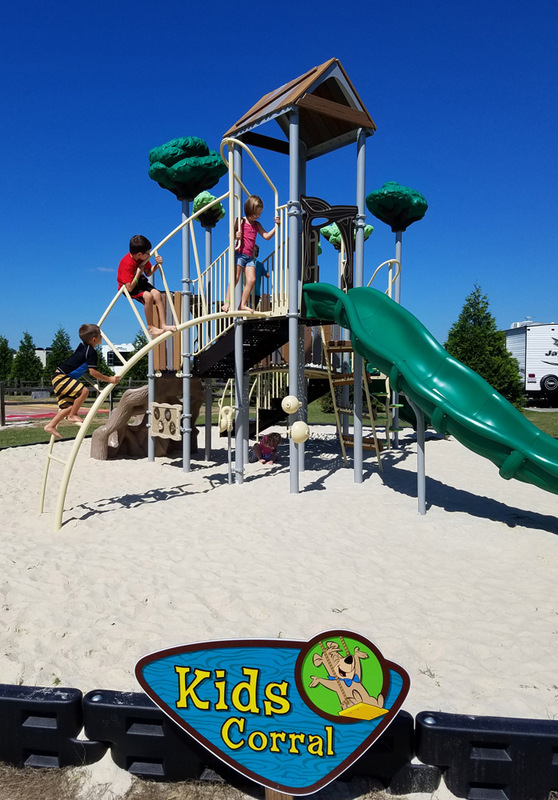 These improvements complement many other onsite amenities, including an activity pool, a gem mining sluice, a jumping pad, a miniature golf course, playground and basketball and volleyball courts. The park also has a horseshoe pit, a dog park with an agility course, fishing ponds and hiking trails. The park also offers homemade ice cream and activities with Yogi Bear™, Boo Boo™ and Cindy Bear™, which make camping at Jellystone Park a unique experience. Jellystone Parks are famous for providing fun, family activities and themed weekends, such as Hawaiian weekends, which often include limbo contests, sand castle building, and luaus. Mardi Gras themed weekends include parades, cookouts and dances, while Christmas in July weekends include campsite decorating contests, campsite caroling, cookie and ornament making activities. The increasingly popular Halloween themed weekends include costume and campsite decorating contests and trick or treating activities. For more information, visit www.taborcityjellystone.com.